Time for another Read Aloud Thursday post. Read Aloud Thursday is hosted weekly over at Hope is the Word. Several weeks ago Bookworm1 was invited to choose our next read aloud chapter book. 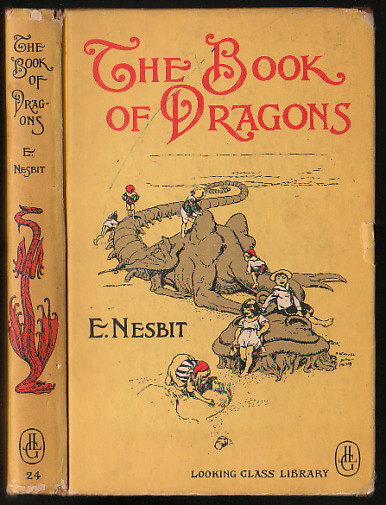 Out of the options presented to him, he selected The Book of Dragons , by E. Nesbit. I'm rather glad he did. Once upon a time - back in 2008 - I read my first Nesbit book. This is what I said about it. I cannot tell you how very annoyed I am that I couldn't string together two thoughts of my own because now I have no recollection whatsoever of what the book meant to be me or what particular parts stood out in my mind. I guess all I can say now about that book is that, "I recall liking it." As for The Book of Dragons I can say that I loved it and I shall now be slightly more detailed in sharing the reasons why! Nesbit, if you've never read her, is a delight. True confessions - I only took serious note of her after discovering that her writings influenced C.S. Lewis. He loved reading her works as a boy and in reading them myself (even as an adult) I can totally see why. Nesbit is a fabulous author to read aloud because although her writing is directed towards children, she assumes that even her young readers are clever ones. Her wit makes for charming reading. Both Bookworm1 and myself were completely enthralled with this read and I can imagine us spending many more hours with Nesbit in the future. The Book of Dragons is a collection of eight short stories. Each contains mention of a dragon, if it does not focus completely on the topic. The stories vary in length and complexity but the whole of them are entertaining. Each story is interesting because you never know quite what type of dragon you will encounter. The dragon had purred until he was quite out of breath - so now he stopped, and as soon as everything was quiet the baby must have thought that everyone must have settled for the night, and that it was time to scream. So it began. "Oh, dear," said the dragon, "this is awful." He patted the baby with his claw, but it screamed more than ever. I can imagine that my oldest bookworm found this passage/story even more amusing as he has had to live through two younger siblings learning how to go to sleep quietly at night! And every day the princess came to see Nigel and brought him food cooked by the dragon, and he lived in his cave, and talked to her when she was there, and thought about her when she was not, and they were both as happy as the longest day in summer. Then at least came The Day. Nigel and the princess laid their plans. "You're sure he won't hurt you, my only treasure?" said Nigel. "Quite," said the princess. "I only wish I were half as sure that he wouldn't hurt you." "My princess," he said tenderly, "two great powers on our own side: the power of love and the power of arithmetic. Those two are stronger than anything else in the world." Yes, the book does contain a spot of magic here and there but it is nothing terribly deep or complex. Primarily the book calls you to engage your imagination with the read. If you are willing to apply yourself to dreaming up crazy fun scenarios and are eager for adventures, then you will enjoy this book quite properly. The Book of Dragons was first published in 1900 and was dedicated to Nesbit's daughter and third child, Rosamund Bland. (Tell me you don't find humor in that name. Go on, do!) Judging the whole of her work, Nesbit is credited as having written the first adventure stories for children. We certainly felt as if we had a series of adventures in reading this title and will continue to seek out others. Janet from Across the Page reviewed The Book of Dragons back in 2011 and in the comment section I mentioned that I had just recently purchased it. Two years it sat on my shelf. But it was very much worth the wait! Highly recommended! We so need to read this book. The county library I rarely used has a much better selection, including this one, of Nesbit's books. The only one I own is The Railway Children...from MY childhood! My favorite story is all of them! I love that, it's how I feel too! I read it when I was a child, it's on my Books To Be Acquired list. I have never read Nesbit, although my wife owns some. It sounds like a good read. We enjoy Nesbit here but have not read this one. I must see if I can get it inter-library loan! We are currently on a Nesbit kick at our house, too. We have enjoyed The Railway Children, The Enchanted Castle, and The Story of the Treasure Seekers. We just started The House of Arden, and it seems just as delightful as the others. I'm sure my son would like The Book of Dragons, so maybe we'll pick up that one next. I'm not familiar with this author, but she sounds like one to seek out. Oh man! I haven't read this one, but I LOVED The Five Children and It.